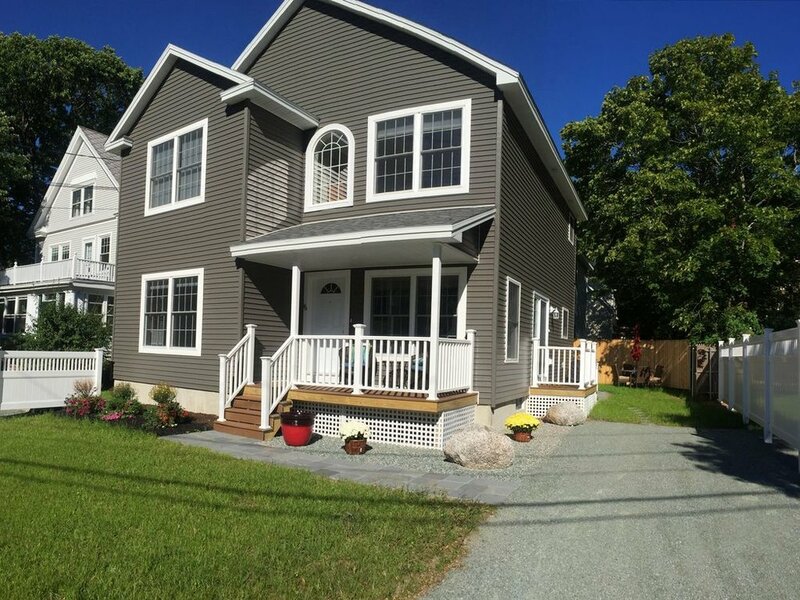 The Carriage House is a newly constructed 2100 square ft. vacation home on a quiet side street in downtown Bar Harbor. 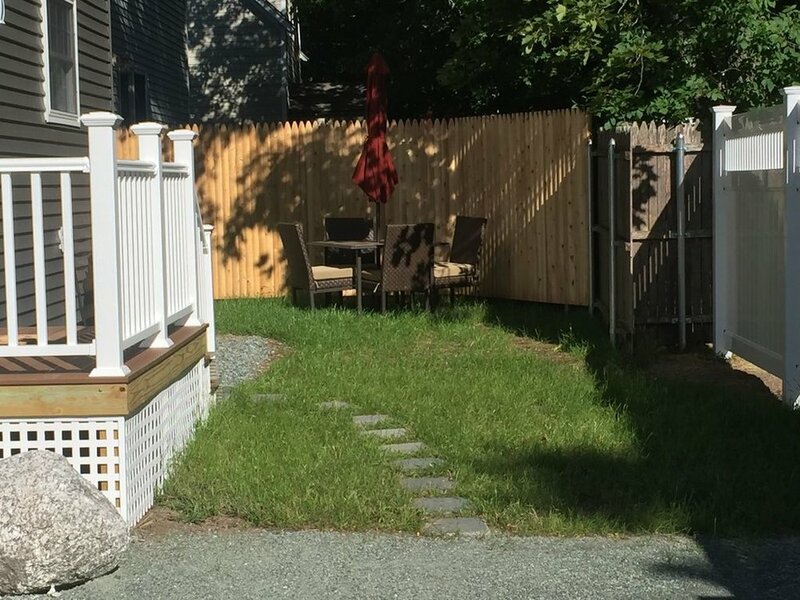 Steps from the water and around the corner from shopping and restaurants, The Carriage House is a prime location for your vacation! Off street parking for two cars will ensure you never have to worry about where you'll park in downtown! The house has an open floor plan with hardwood floors that flow throughout the kitchen, dining area, family room and front sitting room. The family room has a gas fireplace with flat screen TV above. The kitchen has all new stainless steel appliances and a large center island with seating for two. Upstairs are three bedrooms, an oversized master suite with king bed, large walk-in closet and private bath with soaker tub and separate shower. The queen bedroom and twin bedroom share another bath. For extra convenience the laundry room is located on the 2nd floor. The house has air conditioning on both floors and ceiling fans in each room. The lovely front porch is a nice place to enjoy a warm summer evening. The back yard includes a gas grill and dining set with umbrella. We also have two other rental homes on this street, The Holland House and Westview Cottage. If your party is larger than 7 or 8 please inquire about one of our other vacation homes! The entrance to Acadia is just a short drive or bike ride! Air conditioning, master suite, full kitchen, cookware, dishware, utensils, linens, dishwasher, microwave, toaster, cable, Internet, DVD player, laundry, iron, fireplace, gas grill and off street parking. A newly renovated carriage house had all the amenities as well as a convenient location in downtown Bar Harbor. Our stay over the Christmas holiday could not have gone better. Although everything was closed on Christmas Day, we had a well stocked kitchen with new appliances to make our holiday meal. Anne was helpful and responsive to all our questions. We hope to return when we are back in Acadia." We so much enjoyed our stay in this very nice new home located on a nice quiet street in town. During the day we hiked and biked but in the late afternoon and evening we just chilled in the home and relaxed in the kitchen /living room area (with fireplace!) The home is really cozy inside, and was very comfortable for our party of 7. We had our best thanksgiving ever! We hope to return again soon!"